As soon as the Thanksgiving turkey has been consumed, many will prepare for the next holiday of sorts, Black Friday. This year it falls on November 25th and will be the day where many retailers go from being in the red, to making a profit for the year and being in the black. On Black Friday morning, stores will open early offering amazing deals to those who were lucky enough to be first in line. The banner is currently found on a few of Apple’s international websites such as in Australia and Italy, but not on the US site. Yet. Now, before you get too excited, remember that Apple’s discounts are relatively small compared to those offered by electronic retail stores. The good news is the deals usually last the entire day. Another plus, you won’t have to wake up early and stand in long lines. That is, unless you want to. 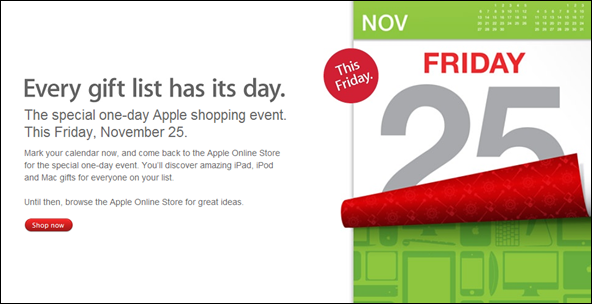 If you’d like to take your new iPod, iPad or Mac home the same day you purchase it, you can walk in to a US store and receive the same Black Friday discount found online. Apple is likely to offer the same range of discounts to their line of iDevices this year, but we will have to wait until Turkey Day before we find out the specifics. If you are not a fan of early wake up times and long lines, you are not alone. Check out what deals are offered online during Black Friday, the results may surprise you. It is such a growing trend that even the next day, known as Cyber Monday, has specials.